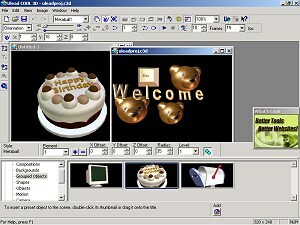 The program is Ulead Cool 3D and it is specialized for 3D texts. But inside it you can find a few 3D objects as well (and more objects can be downloaded) - you can use them in a lot of occasions. You can download 15day trial version of Cool 3D from this page . (You can find the link to this program on our download page for members - and we update it there when necessary). Choose Studio/Shapes. Drag the object to the main window of your scene. Move it, magnify it, rotate it as you wish - you can use your mouse and one of the buttons in the upper part of the application window (with an image of a fist, sphere with arrows etc.) You can choose the right operation from the listbox in the right upper corner as well. The best what the software can do for you is creating a text. Click to the button with the character T on the left. Choose the right font and size. And create your text. You can use a style and texture to it - go to the EasyPalette, to the Object Style/Texture section and drag the right style to the window with your text. When is your picture (or just a simple text object) finished, go to the EasyPalette and choose Studio/Camera. Change Distance parameter (tow bar at the bottom) in the way your picture is no bigger than 2/3 of the all picture. Now shift it to the right (on the button bar under menu Window choose the word Group from the listbox and drag with all objects in your picture at once). Save it as the left view (choose File/Create Image File). Then shift your picture to the left and save it again - as the right picture. And now use 3DJournal software to create anaglyph. You can use any of the created 3D objects in a collage as well. The software has a few interesting functions, animations etc. If you need more 3D objects, go to this page . You will find there a lot of files to download with objects, effects etc. Download any of them, use unzip (the files are compressed) and then in Ulead Cool 3D software in EasyPalette use right mouse button and choose import. Imported objects will be sorted to appropriate categories automatically.